As Darwen looks around the store, he notices one mirror swinging back and forth. When he examines it, he sees not his own reflection, but that of the flying flittercrake (as they are properly known) leering back at him. Dozens of mirrors cover every wall in the store because the proprietor sells nothing but cracked antique mirrors with peeling paint at ridiculously high prices (as in $5000, marked down from $8000). Mr. Peregrine says Darwen is a mirroculist, a person who can see into other worlds through mirrors, but only after sundown. He gives Darwen a small square mirror to take home, a mirror that turns out to be as priceless and perilous as advertised. And so the adventure begins. Darwen seems an unlikely hero. He’s a bit scrawny and newly orphaned, and he’s just moved from England to live with his Aunt Honoria in Atlanta. She sends him to a posh private school called Hillside Academy, where he doesn’t quite fit in. His working-class accent and general lack of knowledge about all things academic make him the target of ridicule from the popular kids. Most of the teachers aren’t very fond of Darwen, either. However, scrappy Alexandra and studious Rich befriend Darwen and are soon privy to his secrets. Darwen hangs the mirror Mr. Perigrine gave to him on the inside of his closet door. The very first night he sees a lovely forested land in the mirror instead of his own face. Boys being boys, he climbs through the mirror and enters the forest. The dellfey – little winged people similar to fairies—inhabit the land that is called Silbricia, along with a host of decidedly dangerous creatures such as scrobblers, gnashers, and shades. The scrobblers have tusks, apelike arms, ride monstrous motorbikes, and carry nets big enough to catch children with. The gnashers have no head or eyes, but instead, possess a mouthful of terrible teeth on their chests. And the shades, well, it’s best to avoid talking about the shades at all. Darwen, Rich, and Alexandra dub themselves the Peregrine Pact, and are soon enmeshed in a struggle that impacts the future of Silbrica, Hillside Academy, and perhaps the world itself. For the Guardians of the Gates are asleep on the job and no one but the three friends stand between our world and the scrobblers who are mounting an attack. They’ve done it before. Darwen and Rich found the evidence during an archeological dig at Hillside Academy—a scrobbler skeleton in a Civil War uniform. It turns out that the school is an ancient portula between the worlds. Darwen and his friends return time and again to Silbrica and witness the dellfeys’ forest degrade into a wrecked industrial landscape as the scrobblers build mountains of machinery designed to stretch Darwen’s mirror from the inside to allow them egress. To make matters worse, the scrobblers require something that only human children possess to power their quest. The story races to a chaotic conclusion during the Hillside Halloween Hop. While the other students are obliviously celebrating the holiday, Darwen, Rich, and Alexandra are fighting to defeat the invaders. 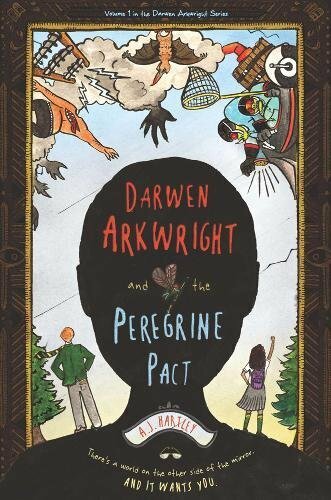 Darwen Arkwright and the Peregrine Pact is jam-packed with action from the first to the last page. The characters are well drawn, the alternative world fully developed, and the situations deliciously scary. There hasn’t been such a “mirroculous” adventure since Alice climbed through the looking glass to play chess with the Red Queen. Monsters, machines, and mayhem—this imaginative story has it all, making it an enticing selection for young readers who fell in love with The Golden Compass and The Chronicles of Narnia.